Janet McNamara is a member of Brentford & Chiswick and Hounslow and District Local History Societies. She is a local heritage guide in Brentford and for some years has been researching her family history in Yorkshire. 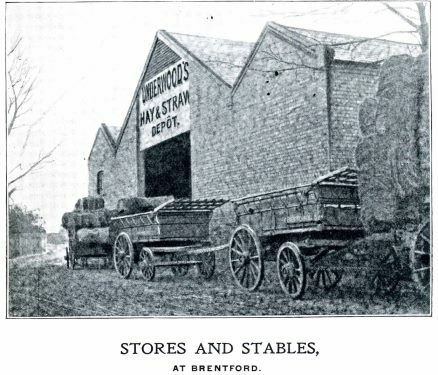 I am also indebted to Trevor and Margaret, friends of the Brentford High Street Project, who in 2017 sent a booklet dating from 1897 which features the Underwood hay and straw business that operated from no. 80 at the time. This is richly illustrated with photographs, some of which are included below. Brentford High Street used to be lined with elegant shops in buildings dating to the 18th and 19th centuries. Most of these were demolished in the 1950s, 1960s and 1970s and replaced when piecemeal redevelopment took place along the High Street. Now the High Street is being rebuilt again and the large numbers of luxury flats and apartments going up can only change the character of the town. A few 18th century buildings still remain though. One such is number 80 High Street, on the south side of the road, opposite Somerfield supermarket. In 1951 it was listed as a building of architectural interest. The listing makes particular mention of the ’ Graceful porch with "Tower of the Winds" columns and pilasters and entablature with carved frieze’. Number 79 is the modern building, see link at end for more about the original building on this site. Number 80 is the C18 building. By 1951 the building was divided into flats but during the previous 200 years some of the most important people in the business life of the town, the Clarke and Underwood families, have lived in this house. The Ealing Parish map of 1777 shows a block of buildings on this stretch of the High Street, with a lane running at right angles south towards the river Brent. It is shown as ’Mr Clarke’s’. Several generations of the Clarke family appear in directories of the town through the 18th century, when the house was built, until late in the 19th century. Early in the 19th century John Clarke and his son Samuel were in the important trade of coal and lime dealing. The 1851 census shows them living at 80 High Street with John’s daughter Mary who it would seem was keeping house. The Clarke family had been born in Brentford. Ten years later John had died leaving a will and Samuel and sister Mary had their nephew from Bath living with them and working as an Inland Revenue clerk. Samuel was no longer ’in trade’ but described himself as a ’Fundholder’ and living on his income from land and dividends. By 1855 Brentford Dock was under construction a few hundred yards behind the house. Access for pedestrians and the horses and carts used for transporting goods was along the lane next to number 79, the neighbouring property, and by 1859 the railway connected the dock with the Midlands and South Wales. In 1865 Edwin Underwood arrived in Brentford, working for the Great Western Railway as superintendent of the goods station at the dock. He had been born in Hampshire and spent his working life organising the transportation of goods. He had worked for a carrier in the West Country and then for a railway company. He was transferred to Stafford where his son, Harry was born, and when the company was taken over by the Great Western Railway he was transferred to Brentford. 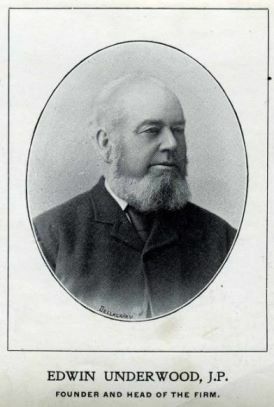 In 1871, in spite of being offered promotion to the job of district manager in another area, Mr Underwood resigned and set up business with Harry as a hay and straw merchant. Their office was at 79 High Street, next door to the Clarkes. 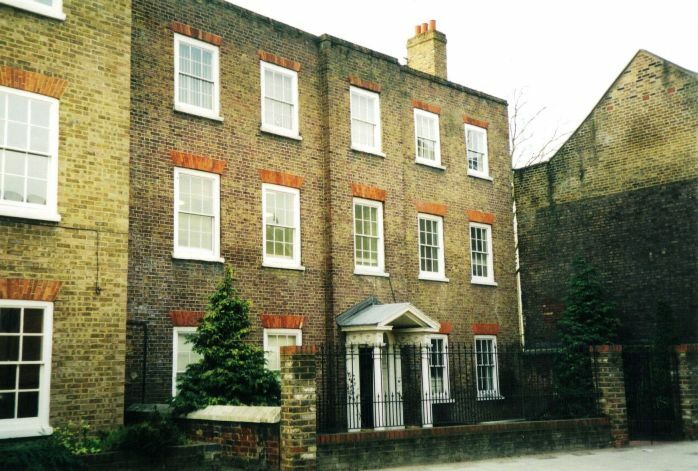 By the time of the 1881 census Samuel Clarke was living with two servants at 80 High Street and Edwin Underwood and his family, which now included a 13 year old daughter and two lodgers, were living in Syon Lane. 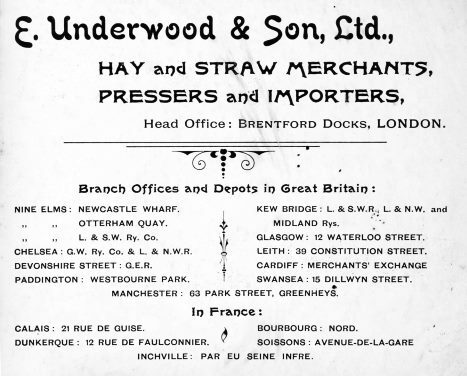 The following year the trade directory shows the Underwoods in business as hay, straw and coal merchants at Brentford Dock and at 79 High Street. By 1888 number 80 High Street had become the home of the Underwoods and was called Brentford House. Samuel Clarke had presumably died since he was aged 80 at the time of the 1881 Census. The Underwoods’ business flourished and expanded, becoming Edwin Underwood and Son, and later ’and Son Ltd’. The company was an early importer of hay and straw, starting with 600 tons of forage per annum from Holland. This had increased to 100,000 tons early in the 20th century. The Underwoods opened factories on the Continent for threshing and pressing and eventually had six depots in London and others in major cities around the country. The company employed 300 people and maintained a stable of 100 horses (see photo below). The Underwoods also traded in lime, coal and coke. Souvenir Of a Quarter of a Century in the Hay and Straw Trade. E. Underwood & Son, Ltd. Thanks to Trevor and Margaret, friends of the BHS Project, for sending the booklet; a selection of photos from it are included below. George J. Lees, Chief Representative in France, 22 years with the firm. A.E. Penn, Chief Cashier, 19 years with the firm. J.H. Bailey, Manager, Import Depatment, 17 years with the firm. A. Frampton, Manager at N. Elms, 15 years with the firm. W.H. Searle, Manager, Westbourne Park, 9 years with the firm. Argyll Lindsay, Manager in Scotland, 5 years with the firm. The second shot was probably taken from the corner of St Paul’s Road; the word ’Fuller’ can be made out on signage on the building to the right and a 1920s postcard of this part of the High Street shows The Feathers, a Fuller’s pub, at no. 232 High Street, opposite Dock Road. 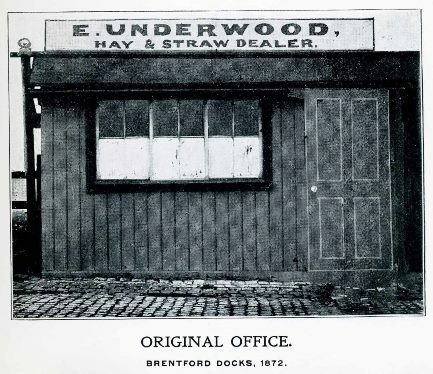 The selection of four photos above show (top left) the title page, listing branch offices and depots in Great Britain and France; the second image shows Underwood’s depot in Brentford, which Janet writes about below. 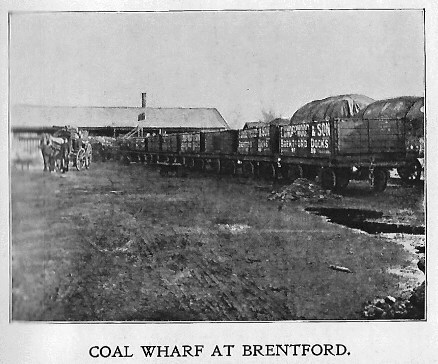 The coal wharf features in the third photo and 'View outside Brentford stables' the fourth. Janet continues: Underwoods main depot was still in Brentford and a building for storage had been put up in the garden of number 80. At the time of writing (Spring 2003) this building is still standing in Dock Road but it probably won’t be for much longer, since it is included in the area south of the High Street due for redevelopment. Until 2001 it was used as an engineering workshop and until quite recently the sign Underwoods Hay & Straw depot was legible on the fascia board, but is now hardly visible. Janet provided an update regarding the redevelop[ment of this area in January 2018: the storage and stables building was demolished a few years ago leaving a big open yard which is used for a fleet of old London Routemaster buses. They are hired out for wedding and birthday parties and tours and have several on a circular route picking people up for a free trip to Brentford Festival in September. 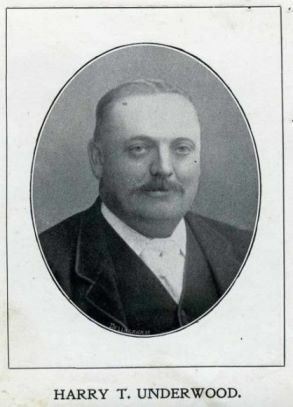 Edwin Underwood became a JP and a member of Brentford Local Board. He was President of the local Liberal Association, an enthusiastic cricketer and captain of Boston Park Club. His name appears on the foundation stone of the library and of the disused Brentford baths. He is recorded as being one of the official party which met Andrew Carnegie when he performed the opening ceremony of Brentford library in 1904. Edwin’s son, Harry was considered an expert in the business of importing forage and was asked for advice by the Canadian Government when they wanted to develop trade with Britain. Like his father he was a member of the local Liberal Association, becoming secretary, and was a vice president of Brentford Football Club. By the time of the publication of the 1903 edition of Kelly’s directory Edwin was about 63 years old. He would appear to have retired from the business and was living at 14 Boston Road. Harry was living at number 80 Brentford High Street with the offices for the hay, straw, coal and coke businesses at number 79. 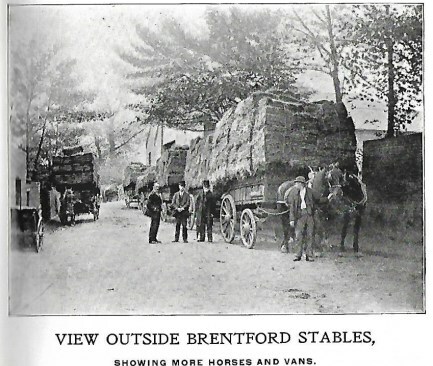 The company had depots at the dock, at the railway yard in Lionel Road (see photo above) and at Brentford Market, all places where large numbers of horses were used for transporting goods and needed forage. 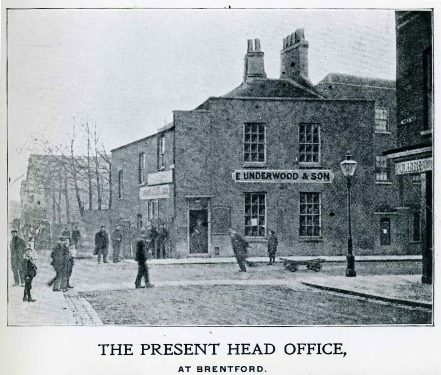 The 1914 directory is the last one to mention the Underwoods in Brentford. Edwin died in 1915 and the hay and straw business would have been declining with the invention of the internal combustion engine, but Harry’s other business ventures must have thrived. In 1882 Harry had married Caroline Hall at the church of St Clement Danes in London. They had five daughters and for some time continued living at 80 High Street. By 1921 they had moved to Broughton Manor, an Elizabethan manor house in Otford, Kent. Their fourth daughter, Ivy on a visit to old friends in Brentford met Harold Band, son of one of the local parchment makers. They had known one another some years before as the Band family lived next door to Edwin Underwood in Boston Road, but they had not met since the war. Harold took the liberty of writing to ’Dear Miss Underwood’ asking if she would meet him in London. They were married in 1923. One of Harry and Ivy’s sons has written a history of the Band family, a copy of which has been deposited in Chiswick Library. This son remembers being picked up by Rolls Royce when he was a child to be taken on holiday to his grandfather Underwood at Otford. This luxury, though, only lasted until 1931 when his grandfather, Harry Underwood went bankrupt. In 1917 a Laurence Perugini lived at 80 High Street but after that it seems to have been empty for some time. The offices at number 79 were occupied by a concrete construction company and a metal refining company during the 1920s. By the time of World War II, number 80 was in flats with 15 occupants. Brentford Dock closed in the 1960s and was rebuilt as an area of flats and houses. Pedestrian access is still via Dock Road which retains its original surface of granite setts. Number 79 was demolished and rebuilt as offices in a style matching its 18th" century neighbour, and in 1999, number 80 was refurbished and also let as offices. An article in the Brentford Chiswick and Isleworth Times in February 1999 reported that part of the building was the London office of the World Trade Centre. In an interview with the managing director he claimed that the World Trade Centre needed a base within easy distance of Heathrow and central London, and on seeing the door of number 80 had thought ’oh wow’and been determined to take this building ’with character’. Sadly, the World Trade Centre has now moved out. There is now only one company name on the board by the door and new tenants are being sought. Information about neighbours of no. 80. Trade directories, census information, Band family history (read about George Band, councillor).